Looking for a half-ton pickup with clever outside-the-box thinking? You'll want to look closely at the 2016 Ram 1500. A unique coil spring rear suspension gives it the smoothest unloaded ride, but it can still tow your trailer like a champ with its stout Hemi gasoline V8 or torquey turbodiesel V6 engine. Don't plan to tow much? We're big fans of the smooth and efficient base gasoline V6, too. Excellent cargo management options and an attractive interior complete the package. Read on to discover more. The upgraded center console (including enhanced connectivity features and a phone/tablet mount) that debuted in last year's Laramie Limited and Rebel trims becomes the standard console on the 2016 Ram 1500. There are several new color and trim variations of the Ram Sport, and LED cargo-box lights are newly available. Smooth-riding coil spring rear suspension also enables air-suspension option; excellent trio of engine choices; smooth and efficient eight-speed automatic transmission; Rebel 1500 off-road package more than just stickers; cabin is quiet and attractive; straightforward controls and audio. Although its last full redesign was in 2009, you wouldn't know it from the way the 2016 Ram 1500 handles itself. From the high-quality cabin materials to the easy-to-use infotainment system and remarkably supple ride, there's plenty here to make up for the relative lack of newness. All the major players in this segment have been thoroughly overhauled over the last few years, but the Ram's refined manners belie its age. It's still a great choice if you're looking for a full-size truck. Introduced last year, the 2016 Ram 1500 Rebel is an off-road-ready beast with an intimidating presence on the road. That smooth ride remains one of the Ram's most distinctive traits, and it comes courtesy of the class-exclusive coil-spring rear suspension, which is better at smoothing out and reducing the harshness of rough road surfaces than the typical leaf-spring setup. The flipside is mildly reduced towing capacity, but if you're running up against this truck's towing limits, you'd probably be better off with a heavy-duty model anyway. The optional air suspension makes the Ram even more comfortable, and it has a self-leveling feature that keeps the truck from drooping when dealing with a heavy trailer or full payload. Revisions to the Ram 1500 are minimal for 2016. The full center console with connectivity and storage for mobile devices, introduced on a limited basis last year, is now the default specification. Several new variants of the Sport offer a choice of bright exterior paint schemes and minor trim tweaks. Also newly available are LED lights in the bed, an especially useful feature with the optional tonneau cover in place. Even though the 2016 Ram 1500 is one of our favorite full-size pickup trucks, the 2016 Ford F-150 is quicker on its feet, with a lightweight aluminum body and two strong turbocharged V6 engines. The 2016 Chevrolet Silverado and the similar GMC Sierra offer competitive powertrains and features, while the all-new 2016 Nissan Titan XD splits the difference between regular- and heavy-duty with a diesel V8 that's more capable than the Ram's diesel V6. There's also the 2016 Toyota Tundra, but it lags behind in ride quality and fuel economy. The 2016 Ram 1500 may be the grizzled veteran in this segment, but it's still a prime pick. The 2016 Ram 1500 is a full-size pickup available in multiple body styles. The regular cab generally seats three and is available with either a 6-foot-4-inch or 8-foot cargo bed. The extended cab ("Quad Cab") can seat up to six and comes only with the 6-foot-4 bed. The crew cab increases rear-seat legroom and is available with either a 5-foot-7 or 6-foot-4 bed. There are 11 trim levels: Tradesman, Express, HFE, SLT, Big Horn/Lone Star, Outdoorsman, Sport, Rebel, Laramie, Laramie Longhorn and Limited. The workhorse Tradesman comes standard with 17-inch steel wheels, black bumpers/grille/door handles, a seven-pin wiring harness, a Class IV receiver hitch, active grille shutters (with the eight-speed automatic transmission), automatic headlights, a locking tailgate, a spray-in bedliner, vinyl floor covering, air-conditioning, a 40/20/40-split front bench seat, vinyl upholstery, a tilt-only steering wheel, cruise control, a 3.5-inch driver information screen, privacy glass and a six-speaker sound system with a USB port and an auxiliary input jack. Extended and crew cabs also have power windows and locks. The Express is similar to the Tradesman but deletes the receiver hitch and bedliner (both are optional), and it comes standard with 20-inch aluminum wheels, body-color bumpers/grille, foglights, carpeted floors and floor mats. The HFE (high fuel economy) trim level comes only in the regular- or quad-cab body style with the 6-foot-4 cargo bed, rear-wheel drive and the gasoline or diesel V6 engine. It includes black bumpers/grille, automatic engine stop-start (not available on any other trim level), 17-inch aluminum wheels, a tonneau cover and cloth upholstery. The SLT adds chrome exterior trim, heated mirrors, power accessories, remote keyless entry, full center and overhead consoles, dual gloveboxes, a 5-inch touchscreen interface, satellite radio and Bluetooth phone and audio connectivity. Extended and crew cabs add a rear backlight and a power-sliding rear window. This handy center console becomes the standard design for 2016 and includes a clever mounting shelf for portable devices. The Big Horn (Lone Star for Texan buyers) includes a 115-volt power outlet, upgraded cloth upholstery, a 10-way power driver seat (with power lumbar) and a leather-wrapped steering wheel. The Sport adds the V8 engine, body-color exterior trim, 20-inch wheels, projector headlights with LED accents, LED taillights, LED interior lighting, power-adjustable pedals, a rearview camera, a charge-only USB port and an upgraded 8.4-inch touchscreen infotainment system with an SD card slot, "Uconnect Access" smartphone integration and online/emergency services (includes Wi-Fi hotspot capability). Note that the regular-cab Sport is packaged as a special R/T model with the 6-foot-4 bed, 22-inch wheels, performance gearing, a limited-slip differential, a unique hood, a black grille with R/T badging and a seven-speaker audio system. The Laramie (extended and crew cabs only) reverts to the gasoline V6, chrome exterior trim and front bench seat from the Big Horn. Otherwise, it includes the features from the Sport, adding chrome-accented 20-inch wheels, two-tone paint, auto-dimming mirrors, leather upholstery, wood interior trim, interior ambient lighting, a 7-inch driver information display, dual-zone climate control, ventilated leather-trimmed front seats (vinyl rear seats), a heated steering wheel, driver memory settings, a six-way power passenger seat and a 10-speaker surround-sound audio system. The Laramie Longhorn (crew cab only) adds the V8, unique exterior styling cues, the spray-in bedliner, tow hooks, LED bed lighting, a larger fuel tank, remote ignition, front and rear parking sensors, upgraded wood interior trim, a wood-accented steering wheel, upgraded leather upholstery, leather-trimmed rear seats, HD radio and a navigation system. The Limited adds monotone paint, side-step bars, automatic windshield wipers, automatic high beams, chrome bed rails, a self-leveling air suspension, keyless entry and ignition, even fancier leather upholstery and heated rear seats. The Ram is also available in two off-road-oriented variants, Outdoorsman and Rebel. The Outdoorsman can only be ordered as a four-wheel-drive model with the crew or Quad cab. It starts with the Big Horn trim and adds 17-inch wheels with all-terrain tires, heavy-duty rear shock absorbers, painted black fender flares, a larger fuel tank, underbody skid plates, tow hooks, auto-dimming mirrors, remote engine start, front bucket seats and rubber floor mats. On the entertainment front, you get the 7-inch driver information display and the upgraded 8.4-inch touchscreen bundle. Like every full-size truck these days, the 2016 Ram 1500 turns into a full-blown luxury vehicle at the top of the range. The Rebel is the more off-road capable of the two, and is only available in the crew cab with the 5-foot-7 bed. On the outside, you'll find features similar to what is included on the Sport R/T, in addition to 17-inch wheels with all-terrain tires, black fender flares, front and rear Bilstein shock absorbers, tow hooks, LED foglights and keyless entry. The interior is similar to that of the Sport, although a six-way passenger seat, heated front seats and a heated steering wheel are also included, as is unique cloth-and-vinyl upholstery. These trim levels are generally just starting points, as many of their standard items are optionally available on other trims (including the HFE's standard tonneau cover, which is optional on all other Ram 1500s). Notably, the "RamBox" weatherproof bedside bins are a standalone option on models with the 5-foot-7 and 6-foot-4 beds (except the HFE). Other &agrave; la carte items include various appearance enhancements, a sunroof and a rear defroster. The 2016 Ram 1500's base engine is a 3.6-liter gasoline V6 generating 305 horsepower and 269 pound-feet of torque. The transmission is an eight-speed automatic. Rather than a traditional shift lever, the eight-speed is controlled by a rotary knob on the instrument panel. A rear-wheel-drive (2WD) layout is standard, but there are two available 4WD systems. Both have a two-speed transfer case with low-range gearing. However, one is a traditional part-time system with manual mode selection, while the other additionally offers an Auto 4WD mode that automatically switches between rear- and four-wheel drive as conditions dictate. Naturally,EPA-estimatedfuel economy of the Ram 1500 line varies widely among the various powertrains. 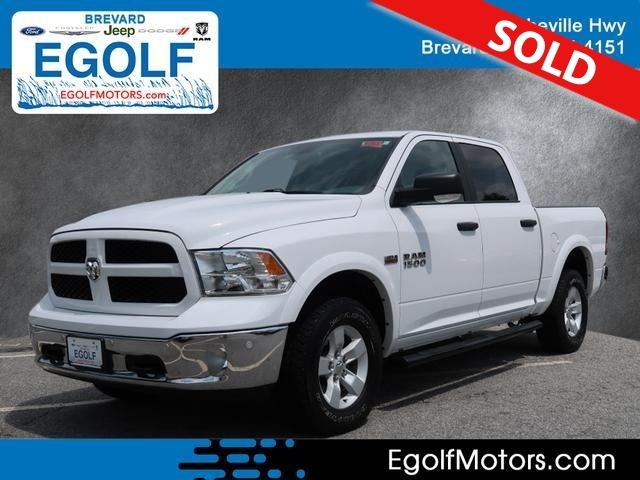 With the standard V6, the 2016 Ram 1500 4x2 boasts EPA-estimated fuel economy of20 mpg combined(17 city/25 highway), bumping up to21 mpg combined(18 city/25 highway) in HFE trim. The 4WD falls to19 mpg combined(16 city/23 highway). In Edmunds testing, a Ram 1500 SLT quad cab 2WD with the V6 accelerated from zero to 60 mph in 7.9 seconds, while a slightly heavier SLT crew cab V6 2WD did it in 8.0 seconds. Standard on Sport, Laramie Longhorn and Limited (and optional on all other Rams except the HFE) is a 5.7-liter V8 with 395 hp and 410 lb-ft of torque. When specified on the Tradesman or Express, the V8 is hooked to a six-speed automatic transmission, with an eight-speed automatic offered as an option. The eight-speed is standard on all other V8-equipped Ram 1500s. The V8's fuel economy with the six-speed checks in at16 mpg combined(14 city/20 highway) with 2WD and15 mpg combined(13 city/19 highway) with 4WD. The eight-speed improves the V8's ratings to17 mpg combined(15 city/22 highway) for 2WD and17 mpg combined(15 city/21 highway) for 4WD. In Edmunds testing, a Ram 1500 Sport crew cab 4WD made the sprint from zero to 60 mph in 7.1 seconds, which is slower than average for a full-size pickup with a V8. Optional on all trims except Express, Sport and Rebel is the "EcoDiesel," a turbocharged 3.0-liter diesel V6 rated at 240 hp and 420 lb-ft of torque. An eight-speed automatic is mandatory. Fuel economy is stellar at23 mpg combined(20 city/28 highway) for 2WD and22 mpg combined(19 city/27 highway) for 4WD. The HFE EcoDiesel goes even further at24 mpg combined(21 city/29 highway) which earns it the title of most fuel-efficient full-size pickup. In Edmunds testing, a Ram 1500 Laramie crew cab 4WD with this diesel engine accelerated from zero to 60 in an unhurried 8.7 seconds, though the engine's ample torque makes a diesel-powered Ram 1500 feel quicker around town than its acceleration time would indicate. It's also worth noting that the Nissan Titan XD needed nearly a full second longer to hit 60 mph despite its more powerful diesel V8. A properly equipped Ram 1500 with the gas V6 can tow up to 7,610 pounds, while the diesel V6 maxes out at 9,210 pounds. The V8 can tow up to 10,640 pounds — less than its competitors, but not by much. The maximum payload for the gas V6 is 1,890 pounds, decreasing to 1,800 pounds with the V8 and 1,600 pounds with the diesel V6. Standard safety equipment on the 2016 Ram 1500 includes four-wheel antilock disc brakes, stability control, hill-start assist, trailer-sway control, front-seat side airbags and full-length side curtain airbags. A fully integrated trailer-brake controller is available, as are a rearview camera and front and rear parking sensors. Models with Uconnect Access have an emergency telematics system that connects you with 911 operators at the touch of a button and provides stolen vehicle tracking. During Edmunds testing, both a Quad Cab 2WD with the gas V6 and a crew cab 4WD with the diesel V6 came to a stop from 60 mph in 128 feet, which is average for similarly configured full-size pickups. In government crash testing, regardless of cab length, the Ram 1500 earnedfour out of a possible five starsfor overall crash protection, with four stars for frontal crash protection,five stars for side crash protection and four stars for rollover potential (2WD) but just three stars with 4WD. The Ram 1500's cabin is as good as it gets in the pickup segment. Even the lower trim levels boast an attractive design, with satisfactory materials and intuitive controls that are reasonably easy to reach, while the available wood trim and premium leather upholstery are predictably posh. Seasoned truck owners might be thrown off at first by the rotary shift knob on the dashboard, but it quickly becomes second nature, and it frees up useful storage space compared to trucks with console-mounted shifters. The front seats themselves are soft, yet strike an adequate balance between support and comfort. The crew cab's rear seat is very comfortable, offering loads of legroom and an agreeable seatback angle. The 2016 Ram 1500 has arguably the nicest interior in its class, featuring an attractive, no-nonsense design and generally good-quality materials. Two touchscreen interfaces are available (one measuring 5 inches, the other 8.4 inches), and they do a great job of controlling both simple and complicated tasks. The upgraded screen is particularly handy and appealing; it's one of our favorites in any vehicle. The virtual buttons are large and easy to see at a glance, while physical knobs and buttons provide much appreciated redundant control. Other modern convenience features include keyless entry and ignition, power-adjustable pedals, Bluetooth, voice controls, smartphone integration and even WiFi hotspot capability. The power-adjustable pedals on higher trim levels are a welcome addition given the steering wheel's tilt-only adjustment. The Ram provides plenty of standard and optional storage spaces. The extended cab has a clever fold-out flat floor space when you flip up the 60/40-split rear seats, while the crew cab features watertight storage compartments under the rear floor as well as shallow bins under the flip-up backseat. A unique Ram feature is the optionalRamBox system, which places a pair of lockable compartments over the rear fenders inside the truck bed. With the right equipment levels, these compartments can even be locked and unlocked via remote. While the 5.7-liter V8 has the highest rated towing capacity, the diesel V6 is a close second, and it offers much better fuel economy to boot. Although the diesel's acceleration numbers are on the slow side, we've found that it's just as capable as the other engines for normal commuting. That said, if you're not planning to do any towing, sticking with the base gasoline V6 engine will save you a bundle and give you a bit more quickness with the pedal pinned to the floor. Gearchanges from the eight-speed automatic are almost imperceptible, so the transmission never feels busy, as you might expect with so many gears. It's also a benefit when towing, as there are more ratios available to achieve an ideal engine rpm, and it could even reduce your need to get a different axle ratio. The Rebel is clearly the bad boy in this family, but any 2016 Ram 1500 4x4 gives you both off-road ability and on-road civility. From the driver seat, the Ram feels more refined than its competitors, as its ride quality is smoother and steering more precise than you'd expect in a full-size truck. Running at speed on the freeway, the Ram 1500 is impressively quiet and composed. It gets even better when fitted with the available air suspension, a unique feature for this class that allows the truck to drop 2 inches to ease liftover and step-in heights when parked. Two off-road settings for the air suspension also allow increases of 1.2 and 2 inches above the standard height for extra clearance.